With over 10 years in the holiday accommodation business and dozens of satisfied customers we believe to have the experience and knowledge of how to make your holiday accommodation in our villas unforgettable and worth to remember for a lifetime . Some of The villas have been fully renovated at a higher standard for a unique experience living by the sea. Carefully designed in a modern more functional, luxury and yet a simple way in order to offer you the best possible accommodation that you could have. Platzia Holiday Vacations Villas are a family owned business of villas for rent in Cyprus, Paphos and Coral Bay. Stelios and Eleni Papageorgiou are the owners of these Luxury Cyprus villas for rent and have a hands approach towards their business, being present on site almost everyday. The Papageorgiou’s offer traditional Cypriot hospitality and a true family atmosphere is obvious. 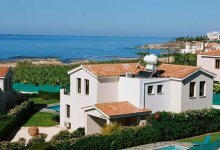 In Paphos these luxury Cyprus villas with private pool are second to none, being carefully designed and well maintained. Choose Platzia Holiday Villas, the perfect choice of villas in Coral Bay, Cyprus for your holidays, because you deserve an unforgettable holiday. The complex consists of 5 Properties , 2 sea front three bedroom villas with private pool, 2 three bedroom villas with private pool and sea view and one four bedroom villa with private pool and sea view. The complex is located near the fantastic beach at Coral Bay and the residential area of Kisonerga, which is one of the most picturesque villages in the Pafos district. To Kato Paphos and Paphos Town or Coral Bay it takes approximately seven minutes by car or by bus and the bus stop is short walk away from the project. The villas are just 20 meters from the coast and offer unobstructable views of the sea, where you can savor the mesmerizing sunsets in complete privacy. 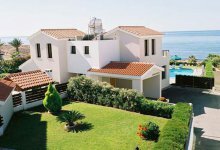 The elegant and modern Cyprus Holiday Villas are constructed to a high standard, with luxury finishing, fully furnished, and internet access free of charge.